Double layered, strong and thick slapper from Kiotos Leather, comes with reinforced handle with sewn edges. At one side of the tip are pointed rivets in X-shape attached, just spank hard enough to give your partner that beautiful red marks! Extra long with 45 cm total length. 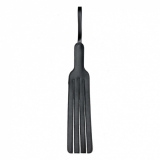 Leather Slapper Whip "Devil's Tail"
Paddle Silicone with Texture "Paddle Me"